Lately I've been fascinated by the concept of personal learning environments. As an instructional designer and trainer, I've spent a lot of time trying to develop learning experiences for other people. But through my own personal experiences with Web 2.0 tools, as well as my ongoing belief in constructivist theories of learning, I've come to believe that the future of staff development lies in our ability to go beyond structured training to facilitating informal processes and learning experiences that occur on a daily basis. While there may always be a place for very structured "event-based" learning, I think that we can get more "bang for our buck" if we think about how to help staff use a variety of tools to construct their own learning experiences. a Personal Learning Environment is a facility for an individual to access, aggregate, configure and manipulate digital artifacts of their ongoing learning experiences. 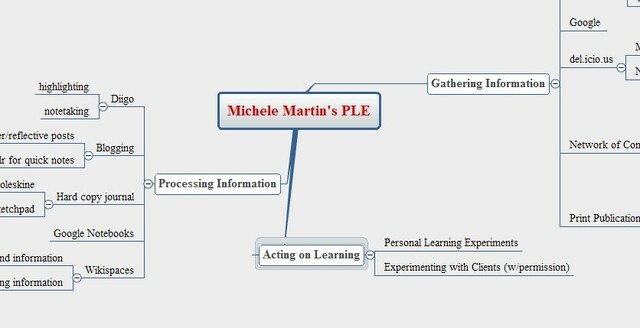 In other words, a PLE is a combination of the formal and informal tools and processes we use to gather information, reflect on it and do something with it, which is essentially what we mean when we talk about learning. Note that I mention that informal learning is a big part of the PLE. By some estimates, 75-80% of on-the-job learning is done informally--that is, outside of a classroom-based (physical or virtual), highly structured learning situation. With the growth of the Internet and a variety of second generation web tools, the ability to construct a personal learning environment that emphasizes and leverages informal learning has really exploded. I want to talk about each in more detail below. You'll see that I use a variety of tools and processes for each phase of learning, most of them web-based. For me, it's been the growth of these kinds of tools that has given me the ability to create a personal learning environment and in the past year, I've seen a real explosion in my own growth as a result. With Feedraider, I monitor a ton of blogs in different areas (technology, nonprofit, business, education/learning). Often, those blogs will take me to other blogs where I either sign up for a feed or bookmark a post into my de.licio.us account (another key information-gathering tool). I also use Feedraider to keep on top of online versions of print materials (like Wired, Business Week, etc. ), online journals, and to monitor RSS feeds for del.icio.us and technorati tags that I've set up in my account and for my Ning groups (although I forgot to include a few of these in my mindmap, I realize). These are the materials that I sort of "graze" through. I have no particular objective in mind and will tend to just click through to things that interest me. When I have a specific learning objective in mind, then I use things like Google or a search of del.icio.us or technorati tags. I will often activate my network of contacts at that point, too. Again, I find that technology has enhanced this networking ability in a couple of ways. First, my network is much broader than it used to be. Through tools like LinkedIn, blogging and listservs, the number of people I "know" and from whom I can get information has really grown. The technology has facilitated the ways I can get information, too. In addition to using blogs and lists to communicate, I also use Skype and GoogleChat for making contact. And of course I still have phone (landline and cell) and personal contact as additional ways to connect. One thing I noticed is that I tend to read a lot when I'm doing research--not just because the web obviously has more reading material than anything, but also because I'm a reader. This is why I put Amazon in my PLE. A loyal customer since 1995, I've actually had to force myself to stay away as my bookshelves are already groaning with purchases from them. I do use video and podcasts if I find something really good, but for the most part, this is definitely a reading process for me. Which is kind of interesting given that I have a broadband connection and there's a ton of multimedia available. As I'm gathering information, I also need to process it. When I'm reading online materials, I've started using Diigo to highlight and take notes. This is a switch from my previous practice of using Google Notebooks, but it's working a lot better for me. I need to interact with material as I'm absorbing it in order to make it my own. I've also been using my Tumblr "microblog" to keep track of things that I find. There's a handy bookmarklet in my Firefox Toolbar that allows me to quickly add and annotate info into it and it's been very useful for me to start using microblogging to pull things together for later processing. I also like it for collecting quotes that catch my interest. Another tool that I've come to rely on is my bubbl.us account (my PLE mindmap was created there). I'm definitely a mindmapping kind of gal and I'm finding that I like using this tool as opposed to my old standby, paper and pen. Sometimes I have issues with being able to print or export, but since I'm usually at my computer, I live with working onscreen to review. Writing is a key way that I make sense of my world, so I have several "hard copy" journals that I keep. I like to use Moleskins and blank art journals for that kind of work and I have them in several sizes, including a tiny one that I keep in my purse for when random ideas or connections occur. I HATE lines in a journal, so I try always to get the kind that have blank pages. This blog is another way I process. Sometimes I put up some fairly raw thoughts (this being one of them), but I find that the feeling of having an "audience" makes me less likely to do that all the time, so I might write first in my journal to start making sense and then post here when it gets closer to being semi-articulate. Finally, I have Wikispaces. I've been using it in two ways. First, as a re-organizing strategy that allows me to take information that I've gathered and re-purpose it into some other ways that make sense to me. For example, I've been working on a "Best of Bamboo" project where I'm re-organizing some of my blog posts here into different different chunks. Some are linear, when I find that I've basically written a series without intending to. In other cases I have chunks around different topic areas. I've also been looking at Wikispaces as an eportfolio option (which is a whole other topic area that I intend to write on soon). I've started to upload some things there, but I'm not entirely sure that it's the route I want to go, as there are some other tools (even Typepad) that might make more sense for me. Ultimately, all of this learning needs to go somewhere. If it doesn't change what I do or how I think, I'm not sure I can say I've learned much. I'm a big experimenter, so I find that what I first tend to do in a lot of cases is find a way to do a personal learning experiment. When I was learning about blogging, for example, then I started a blog (it was an art blog, so it was less professionally risky for me, too). When I was learning about wikis, I started my Web 2.0 in Nonprofits wiki. Depending on the learning and who I'm working with, I will also expand my experiments to my clients. Generally I will have tested things on my own before I go there. I will also tell the client that I'm trying something new so that they don't feel like an uninformed guinea pig to my learning. These experiments then become fodder for more learning. I try when I can to reflect on what I've done to see what worked well and what didn't. For example, recently I used a wiki to write a grant and right now I'm in the process of analyzing how that worked for us. I will then incorporate my reflections into the next iteration if I intend to use the learning again. OK--so that's my personal learning environment. I'd be curious to hear from others about how they've constructed their own PLEs, thoughts they have on the concept, etc. It's a topic that I think has real potential for use in nonprofits as a way to keep learning happening every day at a very low cost. But to do this, I think we have to be intentional in exploring what tools and processes are needed to put something together, which is a big reason I wanted to go through this reflection of my own practice as a way to get some ideas for how it could look. I need more than just my thoughts, though, so all feedback on this welcome. UPDATE: Graham Atwell has an excellent introductory paper (PDF) on PLEs, pointing out that what we're talking about here is largely a methodology, as opposed to a particular tool. Also check out his Q&As on PLEs. Also--see the follow-up on how I re-organized some aspects of my ple after writing this post and my list of Top 10 Personal Learning Tools. If you liked this article, you may want to subscribe to my blog so you can be automatically notified when I post new content. To learn more, go here. Just found your blog via Dollar Philanthropy. Loved your post there, love your posts here. Have subscribed. So from this post, it sounds like your a GTD follower, yes? If not, you've seem to have found many of same solutions. Funny you should mention GTD. I've seen a little about it, and it's been on my list of things to get to (ironic, I know), but I haven't really gotten into it. I think I've stumbled into what I'm doing here, by bits and pieces as I've gone along. A lot of trial and error and adopting ideas that I've seen in the trail of crumbs through the web. Now you're making me think, though, that I need to look at GTD more seriously--see what I'm missing. Thanks again for the comments and let me know if you have any GTD resources you'd recommend. For me David Allen's actual book, Getting Things Done, was the most helpful. But the following resources got me interested in going deeper. Perhaps they will for you too. This is an amazing post! I've never thought of calling it a personal learning environment! And I knew we had a lot in common - we're both mindmapping kind of girls! I completely understand your opinion of ed-tech academia. . . .
And Beth, thanks for the compliment--I've learned a lot of my strategies from you! Have you thought of/tried organising your personal tools in a Stringle wrapper (http://ouseful.open.ac.uk/stringle)? Thanks for the tip, Tony. I'll have to check it out. Thank you so much for this post. I'm an ESL teacher at the University of Padua in Italy and I've had my students using all sorts of Web 2.0 tools for their language learning rather than using a platform and I'd never thought of it as a PLE though I have been reading a bit about PLEs. My students are currently editing wiki pages in http://edutechwiki.unige.ch/en/Main_Page and today the wiki administrator, Daniel Schneider sent me a message linking me to this blog. I've never quite decided how to use conceptual maps with my students (it's a big thing here in Italy) and this blog post has given me an excellent idea: have them each design their own PLE as they see it. It's nice to know there are so many other people out there interested in similar issues, even if not all in the same field. So thanks to you Michele, to your links and to the others who have posted replies. Very nice site. Thank's for help. Will tell about you to my friends in Kanzas city. This is a great post! I am working on a thesis on PLEs and got a lot of leads here!